Posted on September 14, 2017 by thelostlighthouse	in Comics, Literature and tagged Andrea Sorrentino, art, Captain America, comic book review, comic books, Hydra, Hydra Cap, Literature, Marvel, Marvel comics, Nick Spencer, Secret Empire, Secret Empire Omega, Steve Rodgers, TLL. Well Secret Empire is finally complete. It’s been a series not without its controversies, from the backlash against Steve Rogers – a character created by Jewish comic book writers turning to the very far right to issues around Magneto’s portrayal as a pro-Hydra villain on one of the comic book covers (he very much stays pro-mutant, anti-Hydra throughout) but for me I think there was very much value in the story it sought to tell, as can be seen in a previous article of mine – ‘Captain America and the Rise of Hydra’ (warning, contains political rambling! ), found here. I didn’t however, review issue 10 of Secret Empire. This was honestly because I found it a little disappointing. The series finale felt rushed with a ‘Cosmic Cube fixes the world’ ending and for me personally what I saw as the key idea the writer Nick Spencer was trying to get at wasn’t properly addressed, i.e. Captain America going Hydra being a metaphor for the rise of far right populism in America. That was until now. I picked up Secret Empire Omega a little tentatively, at a high price and off the back of an ending which didn’t quite hit the mark but as I’ll explain, for me Spencer added some of the ideological struggle to the epilogue of this story the ending was sorely missing. The plot to Secret Empire Omega is necessarily simple. Now the fighting is over and the clean-up beginning Steve Rogers, both good (Captain America for reference) and bad (I’ll refer to as Captain Hydra for lack of a better term) clash again. This time in an ideological debate rather than hand to hand combat. There’s a line from Captain America that may communicate Spencer’s feeling on this that he himself may have wanted more time to dig into this during the main series – that when he saw his enemy there wasn’t time to talk, only fight and close the series out. 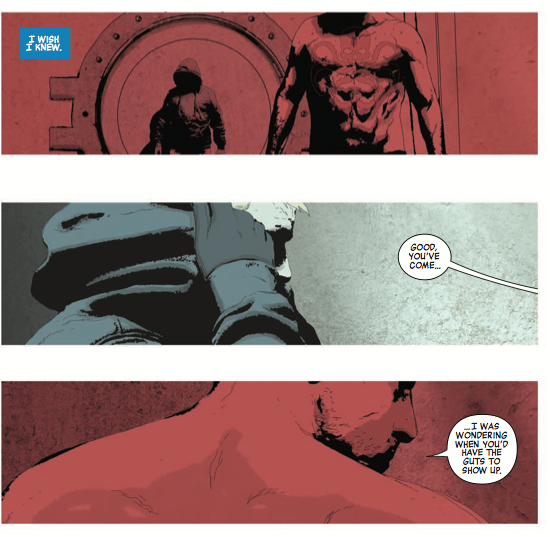 Omega also touches on what the longer lasting impacts of Secret Empire will be – Captain America’s emotional scarring and loss of influence globally (think how America will be post-Trump), the death of a significant character and how other characters are coping now its over. There is a key message in all this as well, if you read Captain Hydra as a metaphor for modern America – You allowed this to happen. Captain Hydra blame Steve Rogers, Carol Danvers, US politicians and pretty much everyone but himself for his rise to power. It’s possible to read this as a criticism of those with influence in the real world where Trump was elected, which was only possible because of the state of the US to begin with. I was a little cheeky with this review and had a flick through one or two of the other early reviews before writing. There’s more I wanted to say than normal and it helped to see if I was missing any other major points. 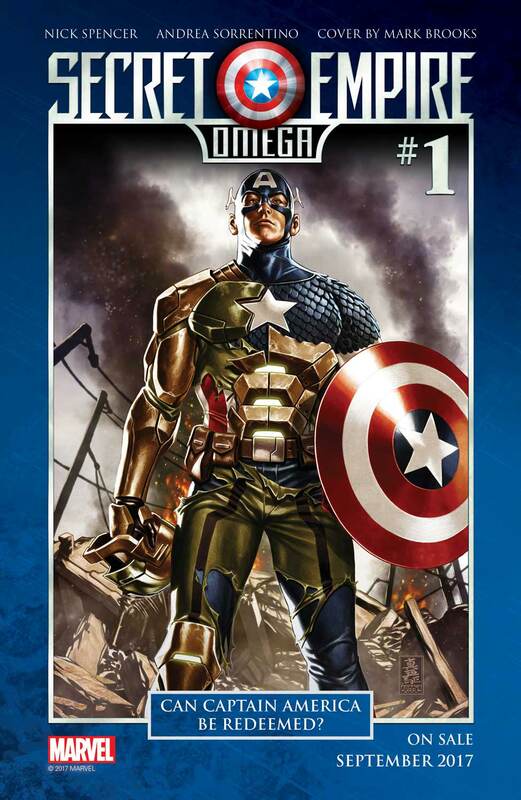 One of the reviews I read criticised the artwork, that Sorrentino’s portrayal of the two Cap’s out of costume not distinctive enough. I noticed this as well but actually liked that they were less distinctive. They look very similar and that’s the point. They’re the same or at least the same bar ideals and the point made earlier – that Captain Hydra could take the power he did because of the actions of Captain America amongst others means the line between them is currently a little blurred. There’s a sombre tone to the art in this issue, with a grey pallet used for Captain America and red for Captain Hydra. I feel the art was exactly how it should have been for this issue. I have complicated feelings towards Secret Empire as a series, but there was an intent with the story which Spencer sought to tell. If you’d asked me before reading this I would have said the point hadn’t been made properly, now it has. On balance, I would rate the series as a whole at 7.5 out of 10, starting close to 10 but moving down to maybe a 6.5. I would have liked to have seen a more optimistic note struck for the other characters than Cap with all this coming to an end as the series does have a fairly downer ending, that isn’t to say it’s bad though. This issue really helped make the ending much more satisfying for me.